Fr. 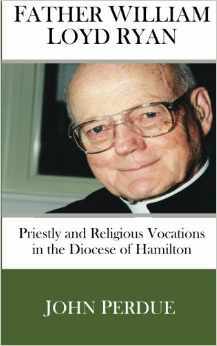 William Lloyd Ryan: Priestly and Religious Vocations in the Diocese of Hamilton is the first publication of Rev. Mr. John Perdue, a seminarian for the Diocese of Peterborough. It is the work of four years of dedicated research during which Perdue had access to Fr. Ryan’s personal papers and travelled across southern Ontario as he interviewed the men and women who had known Fr. Ryan best. Many of these interviewees had entered religious life or become priests because of the counsel and personal example of Fr. Ryan. Perdue argues early in the book that “This analysis of the life and example of Fr. Ryan will provide priests, religious, and laity with an example of ‘what works’—what can be done to foster vocations to the priesthood and to religious life in post-secular North America.” I think that each reader will discover that “what works” is not a particular program or ideology but Fr. Ryan’s conviction, born of faith, that each man and woman receives a supernatural vocation and to respond to this vocation is a work of love whose fruit is true happiness. The first chapter charts the life of Fr. Ryan, and while due attention is given to Fr. Ryan’s formation at St. Augustine’s Seminary and priestly ministry in the Diocese of Hamilton, the author includes several anecdotes, which, as Plutarch says, reveal best the true character of a man. One parish secretary recalls that whenever a cheque needed to be signed and Fr. Ryan could not be found, she would enter the Church and find Fr. Ryan kneeling in prayer before the Blessed Sacrament. Fr. Ryan would “rise, sign the cheque, and be back on his knees before she had left the Church.” The author shows how the profound spiritual convictions of Fr. Ryan made him a zealous and effective parish priest. He cared for his people by his reverent celebration of Holy Mass, his “substantial and brave” preaching, and also by setting up a boxing club for boys in 1943 and introducing young parishioners to the CYO movement. One quality of Fr. Ryan which runs like a golden thread through this book is something he promised to pursue in the resolutions he made before his priestly ordination in 1940. At the top of his list, as it is found in one of the Appendices of this book, he urges himself “To be a man of faith—see God’s work in everything you do, or think, or say. It is all for Him. To seek not yourself, but God’s advantage.” The evidence of personal testimonies and meticulous research carefully collected and analyzed in this book confirms that it was Fr. Ryan’s achievement of this resolution which encourage vocations in the years following Vatican II. This book is more than the story of Fr. Ryan’s priestly vocation, although that story is fascinating enough to merit its own telling. But by placing Fr. Ryan’s life and work as a parish priest within the context of the changes in the Church in Ontario in the sixties and seventies, particularly in Catholic Education and in the lives and work of religious orders, Perdue throws into relief the pastoral wisdom of Fr. Ryan. One example is Fr. Ryan’s deep concern over how the changes in Catholic Education was producing generations of religiously illiterate Catholics. Perdue quotes from a letter which Fr. Ryan wrote in 1972 regarding the new religious education program entitled the Canadian Catechism: “If this series alone is the source of the material to be taught to the children the result will be that the children after eight years of this type of religious instruction, will know practically nothing about the Catholic Faith.” These concerns about the state of Catholic education, which were also felt by a number of lay people close to Fr. Ryan, led to the formation of the Sisters of Our Lady Immaculate, a new religious community of women which combines a deep prayer life with the apostolate of care-giving and teaching. The author has a personal connection with this religious congregation co-founded by Fr. Ryan; his sister is a professed member of the Sisters of Our Lady Immaculate. I heartily recommend this excellent study of the life and times of Fr. Ryan. My only criticism is that the story is so enthralling that the end comes too soon! However, the work of Fr. Ryan’s priestly ministry continues, in the lives of his parishioners, in the ministry of those priests he helped, and in the apostolate of the Sisters of Our Lady Immaculate. This is a book which is still being written, and Deo volente, it will be a fresh chapter in story of the Catholic Church in Canada.